It looks great, and I wondered whether anyone knows if it is possible for SmartThings to control British Gas Remote Heating Control (RHC), which I gather is AlertMe-powered. Hi, I think it would be great if SmartThings is compatible with British Gas' Remote Heating Control (RHC) system. Could someone please validate whether this is the case? And, if not, what it would take? Like SmartThings, RHC depends on a Smart Hub connected to a broadband router by Ethernet. The Smart Hub sends RHC instructions to a wireless handheld thermostat control (the basis of rudimentary in-home remote control), which sends its instructions to a wall-mounted wireless receiver that is connected directly to the boiler. British Gas' Smart Hub is actually a licensed AlertMe hub. https://www.alertme.com/help/smartheati ... tions.html AlertMe says: "The products are not HA compliant and for that reason, our devices use AlertMe-specific ZCL commands. Zigbee uses linear polarisation. AlertMe uses ZigBee chips, manufactured by Ember. EM260 is used in the SmartHub and EM250 is used in the devices." The wireless thermostat control is British Gas-branded WR1. Anyone got any input on how, or whether, this lot can talk to each other please? Interfacing the two would be dependent upon their respective APIs. This is an area in which AlertMe is particularly good - their API for the Energy and Monitoring systems was well publicised at release, and an updated version is available these days. However, for the British Gas version the API has not really been publicised, although it is publicly available. And whether the Heating Controller uses it... well, that's a bit of a mystery, mainly because I can't justify spending £229 on it. On the other side of the fence, the SmartThings API is a little cryptic. They seem focused on in-app 'SmartApps', so it depends upon how these are allowed to chat out to the real world. Just 'on the roadmap' at the moment, so could be some way off yet. You'd then need skills or a friendly developer to create the bridging app that would have the two talk to one another. FYI, those "SmartApps" aren't really apps. They're effectively rules and instructions, written in code. Users can contribute their own code as new "apps". They and/or users seem to be dabbling with writing "apps" code that interacts with other services' APIs, so I presume something may be possible if the British Gas RHC has an API that SmartThings can leverage. (I, however, am not the person able to make that link). You wouldn't get an AlertMe sensor to talk to it, even if you were using the same Ember EM250 / EM260 hardware. AlertMe devices have their own proprietary stack, so although they do talk over a Zigbee-based radio system, they're not speaking an open language, so to speak. I've tried getting them to talk to a system I have with the same EM260 Network Co-Processor that's built into the AM Hubs and never had any luck other than some garbled attempt at a handshake. However, talking through the Hub via the API is a definite possibility. 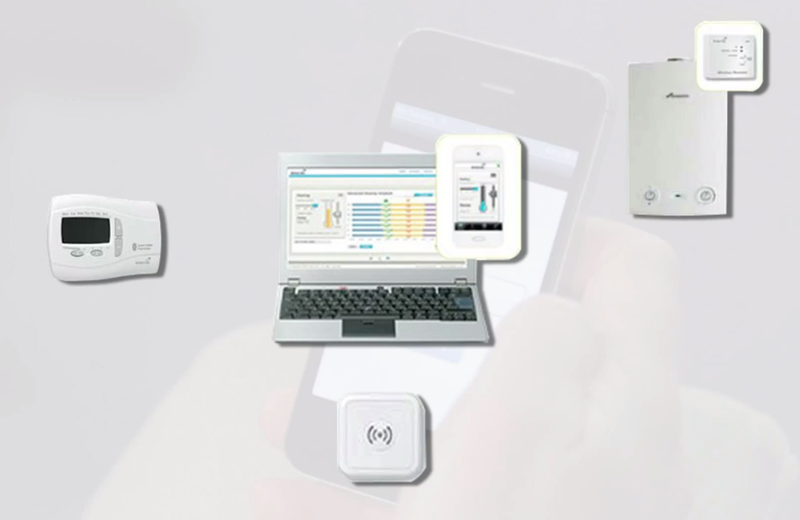 That SmartThings system looks increasingly interesting with that interoperability for other devices. If they get the API stuff right, it could be a real winner. The lack of UK in-wall controllable plugs and sockets is a real problem right now - interstitial devices like the AM SmartPlugs are good, but nowhere near as neat as the equivalents produced for the Iris system (another AlertMe-based product, if you didn't know). robertandrews wrote: That SmartThings system looks increasingly interesting with that interoperability for other devices. If they get the API stuff right, it could be a real winner. The lack of UK in-wall controllable plugs and sockets is a real problem right now - interstitial devices like the AM SmartPlugs are good, but nowhere near as neat as the equivalents produced for the Iris system (another AlertMe-based product, if you didn't know). I think you could plug the boiler into a Belkin WeMo UK smart plug (or, perhaps, another UK Zigbee smart plug) and control the boiler that way. SmartThings even interoperates with Belkin WeMo. But this would just give binary on/off switching. And, I may be wrong on this, but I feel like switching the boiler entirely off and on at the wall is inefficient and not the right thing to do (it might cause the boiler to lose time, for example). roobarb! wrote: That SmartThings system looks increasingly interesting with that interoperability for other devices. If they get the API stuff right, it could be a real winner. The lack of UK in-wall controllable plugs and sockets is a real problem right now - interstitial devices like the AM SmartPlugs are good, but nowhere near as neat as the equivalents produced for the Iris system (another AlertMe-based product, if you didn't know). Holy moly! Those smart plugs are £40 each! Guessing they talk straight to your wifi network though, as I don't see a Hub. Just checked - AlertMe smartplugs are £25 (plus £4.99 per order shipping) from AlertMe, or £29.90 from British Gas, but you would have had to fork out £50 for the energy kit (or already own a security kit). Switching your boiler off at the wall is a definite no-no, at least for Worcester Bosch CDi models. Every time they power up they run a diagnostic and cycle the heating pump. Can't imagine they'd be happy doing that frequently. I'm also using the British Gas MyHome remote heating control and would love to be able to integrate it with SmartThings at some point. The SmartThings hub is yet to hit the UK market, but they've told me they're working on it so hopefully it will happen some time soon. Once it's available, I'll be writing to British Gas to ask that they work with SmartThings to make the MyHome system compatible. It would be good if others who are interested in this would also get in touch with them and ask them to make it happen. It is surely in British Gas's interests to gain compatibility with SmartThings. If SmartThings becomes popular (which it looks like it will), people will be more likely to buy into a system which is compatible with it. I doubt anyone who uses SmartThings will want to buy a remote heating system which cannot work with it.